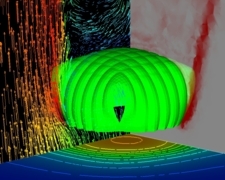 Here we focus on computer modeling of the descent and glide of a complex parachute design resembling the ATPS (XT-11) parachute. 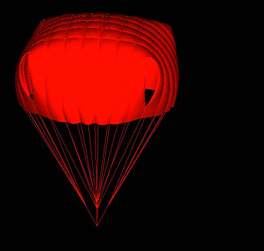 The fluid-structure interaction (FSI) of the parachute decent is simulated for payload levels of 222 and 350 lbs. 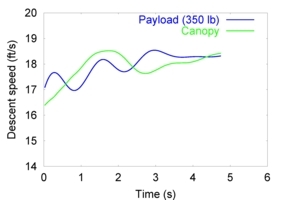 We also model the aerodynamic and FSI response of the parachute when one of the risers is pulled to induce glide. 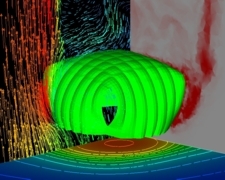 The simulations are carried out in a parallel computing environment with the parallel FSI solver written by the T*AFSM. The underlying methods of the FSI solver were introduced by the T*AFSM over the years. These methods include: the Deforming-Spatial-Domain/Stabilized Space-Time (DSD/SST) formulation [1-4], an automatic mesh update technique , and the quasi-direct fluid-structure coupling method [6-7]. For more on this computation, see . Fig. 1. 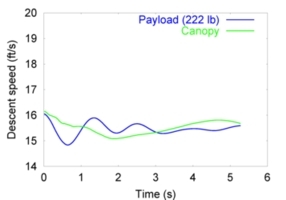 Payload and canopy descent speeds for payload levels of 222 lbs (left) and 350 lbs (right). Fig. 2. Flow patterns before and after the riser pull. In each frame, the left, right and bottom planes show respectively the velocity vectors colored with their magnitudes, vorticity and pressure. 8. S. Sathe, R. Benney, R. Charles, E. Doucette, J. Miletti, M. Senga, K. Stein and T.E. Tezduyar, "Fluid-Structure Interaction Modeling of Complex Parachute Designs with the Space-Time Finite Element Techniques", Computers & Fluids, 36 (2007) 127-135.